I recently received something I previously had never known to exist: a special PCjr version of Ultima II, released by Sierra On-Line sometime in 1984 (the normal PC version was released in 1983). A similar copy is for sale on eBay right now (at a rather ridiculous price). Notice that the label only says "PCjr", not "PC/PCjr" as would be expected. And it is indeed different from the normal PC version! First, there is no copy protection. It has the same copy-protected sector from the Copylock protection that the PC version uses. The executable file (ULTIMAII.EXE) however does not contain the protection envelope, so the presence of the copy-protected sector is never checked for. Apparently Sierra originally intended to use copy protection but found out that it did not work on the DMA-less PCjr. Second, all graphics have been adjusted to yield proper color on the PCjr's composite output. Attached file compareu2.zip contains screenshots from both the regular PC and the special PCjr version, both with RGB and Composite outputs. Playing the PC version on the PCjr would yield completely nonsensical colors on the composite output (and is not included in the archive). Unfortunately, Sierra did not bother to implement an actual 16 color RGB version, likely because that would have required rewriting all graphics code for mode 9, which has a different memory layout. - 1984 Sierra On-Line version for PCjr (no copy protection). - 1985 Sierra On-Line version for PC (revision with Softguard 2.0.3 protection). Other than the different protection code, the game code is byte-for-byte identical to the 1983 version. And of course the two broken CD-ROM collection versions that are based on the 1989 version. There may be yet another PC version out there with a later version of the Copylock protection, as I had found such an executable on a now defunct fserv. Last edited by NewRisingSun on 2015-1-18 @ 23:36, edited 6 times in total. interesting! thanks for sharing the info NRS!!!! >- 1984 Sierra On-Line version for PCjr (no copy protection). >- 1985 Sierra On-Line version for PC (revision with Softguard 2.0.3 protection). Other than the different protection code, the game code is byte-for-byte identical to the 1983 version. Disk 2 & 3 between 1983 and 1985 version are each identical. That is because the version is for PC/PCjr. But it is different from 1984 version because 1984 version is for PCjr version. Track/Sector Information on Disk 1 for each release. The more interesting is that 1984 version works on IBM PC/PCXT not only PCjr though it is for PCjr version. Original release package for Ultima II IBM PC version was sold on ebay over $500, IIRC. For the longest time, it was understood generally that Sierra's contribution to the library of PCjr. software was the AGI engine which allowed for King's Quest and the later games, a cartridge version of Crossfire, a cartridge version of Mine Shaft, and PCjr. graphics support for BC's Quest for Tires, Mickey's Space Adventure, Mr. Cool, Oil's Well, Thexder and Troll's Tale. This year, I have learned that Sierra released three other games with PCjr. specific releases, Wizard and the Princess (the IBM PC version was called Adventure in Serenia), Crossfire (a floppy version with enhanced PCjr. graphics and sound), and now Ultima II! NRS, did your PCjr. copy come in a borderless box or a black bordered box (as shown in the auction) or even a gray bordered box? Did the PCjr. programmer take inspiration from the Wizard of Oz with the yellow bricks, or was red unavailable to him? Great Hierophant wrote: NRS, did your PCjr. copy come in a borderless box or a black bordered box (as shown in the auction) or even a gray bordered box? I don't know what kind of box it originally came in. I have seen PC versions in both in the large two-piece and small gray boxes, so it would have been sensible for Sierra to sell the PCjr special version only in the small black one. Great Hierophant wrote: Did the PCjr. programmer take inspiration from the Wizard of Oz with the yellow bricks, or was red unavailable to him? 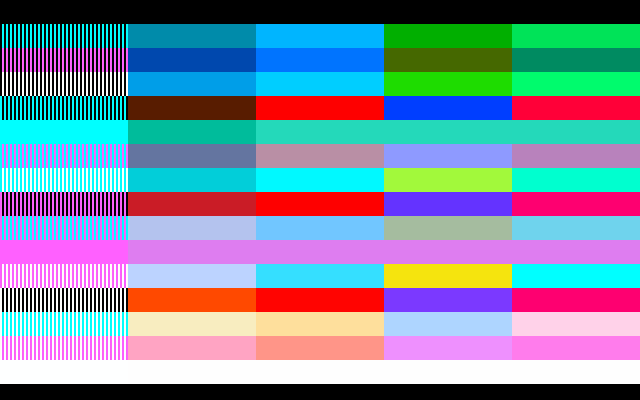 There is no red in the PCjr's composite output when using the four-color CGA palette with white in it (#1). NewRisingSun wrote: The 1989 Origin version replaces the PWM sweeps during the intro with silence and the in-game PWM sweeps with glissandi. I have uploaded a video to YouTube showing the difference in the sound effects between the 1983 Sierra On-Line and 1989 Origin Systems version of the game. If you are interested in testing, codeholio's dosbox-x has the improved pc speaker emulation. I entirely forgot about that! I took that from a thread on this site, however, if I recall the PCjr. colors leave something to be desired. Your bricks in the third screenshot are a bit more yellow than the pattern gives in that chart. - Rob Northen Copylock, by Rob Northen Computing. Only introduced in the 1990s. - Cops Copylock II, by Link Data Security (formerly Link Computers). "Marketed since 1984", which does not fit to Ultima II, whose PC version was released in October 1983. Also, the one Copylock II protected executable that I have has a protection code so vastly different from Ultima II's, it's hard to believe that it would just be a later version. - Copylock™, by Formaster Corporation. Formaster's UK branch would later be renamed to Trace Products. - Copylock, by some Massachusetts company called "Softdesign, Inc". This may or may not have been an actual product, but the trademark was certainly registered. I think this mysterious Copylock found on Sierra On-Line games from 1983 to 1985, the 1984/1985 versions of Ultima III and the EGA disk of Accolade's HardBall! is the product from Formaster Corporation, as it is the only one available in 1983, and is made by a California-based corporation, which I suppose makes it the likeliest choice for California-based companies Sierra and Accolade. Last edited by NewRisingSun on 2015-1-19 @ 16:55, edited 1 time in total. I think Rob Northern may have been a bit late to the PC party, most PC games by 1990 were relying on document checks. Copylock is a very generic term for a copy-protection scheme, I'm surprised anyone was able to register the term as a trademark. Apparently it did not matter much since there were other products that used it. Then again, it was not like companies wanted to publicize the methods they were using with their software, why give the crackers an advantage. Here we see the equipment Sierra used to duplicate disks in the early days. That's the "Formaster Series One" device linked in my previous post (see here and here for clearer pictures). That makes it almost certain that Sierra's Copylock is indeed the Formaster Copylock™ advertised in the linked 1983 Infoworld magazine. Great Hierophant wrote: I think Rob Northern may have been a bit late to the PC party, most PC games by 1990 were relying on document checks. I remember a magazine reviewing the PC version of "Gods" saying that its keydisk protection was a typically British habit.